“Thou seest yon petal of amaranth, blown by the wind from the low sweet brows of Hathor? “(The Magister saw it and rejoiced in the beauty of it. )”” God directs the attention of the Adept to the image of the “petal of amaranth.” Amaranth is a type of flower. The line “blown by the wind from the low sweet brows of Hathor” is a poetic way of saying that the petal of the flower is blown around by the wind of Nature. The Adept’s reaction to seeing this petal is to see its beauty and rejoice therein. “Listen! (From a certain world came an infinite wail. )” God tells the Adept to listen and the Adept hears “an infinite wail.” That is, the Adept rejoices in the beauty of the flower but another sees it and is distressed. They represent two points-of-view from which one can understand phenomena. Crowley comments, “Two points of view: as a girl’s smile involves the death of many cells in her body.”1 Crowley gives another example: a smile can be seen – from a certain perspective – as happy and rejoicing, but – from another perspective – this same smile is a genocide of life, i.e. cells in the body. Specifically, the “wide” or “macroscopic” view can see the beauty in the petal and the smile, while the “narrow” or “microscopic” view can see only destruction and therefore there is wailing and miserable. “That falling petal seemed to the little ones a wave to engulph their continent.” The “wide” and “narrow” views are further explained. The same falling petal in which the Adept rejoiced is the petal that, to others, appears as a catastrophe. Again, the same phenomenon can be interpreted in different ways, and – if one’s vision is narrow – one can interpret a thing of beauty to be catastrophic. “So they will reproach thy servant, saying: Who hath sent thee to save us? He will be sore distressed.”God now counsels the Adept in a particular instance of this more general idea of multiple perspectives of the same phenomenon. God says that “they will reproach thy servant,” meaning that “the little ones” with the narrow view that the petal is a catastrophe will disapprove of the Adept on the material plane. The reference to “thy servant” is, in this particular case, to Aleister Crowley the man. By extension, “thy servant” also applies to every individual’s mind/personality and body as manifested in the world. SUMMARY: Any phenomenon can be perceived from multiple perspectives. What is beautiful and worthy of rejoicing from one point-of-view may be seen as destructive and catastrophic from another point-of-view. Therefore, the Truth of the Adept may be misunderstood by the profane who can only see the narrow view of the situation, which distresses the rational mind of the Adept. Also, the Truth distresses the ego of the Adept him or herself, for it leads ultimately to the displacement of the ego from the center or crown of the individual to which it makes an unrightful claim. Practically, this parable of the petal of amaranth counsels us to expect opposition from others who do not understand us, especially insofar as we are “ascending the steep mountain”8 of Adepthood. This can be seen by anyone who attempts to explain spiritual truths to those who are not familiar by experience, especially when done in a symbolic language such as that of the Qabalah. This parable also counsels us to expect resistance and distress from our own ego in our path to uncover the Truth. 1Commentary to Liber LXV, I:34-36. 2Commentary to Liber LXV, I:37. 3Liber Porta Lucis sub figura X, lines 15-16. 4Liber AL vel Legis, II:25. 5Commentary to Liber LXV, I:38. 6Commentary to Liber LXV, I:60. 7Commentary to Liber LXV, I:60. 8Liber Porta Lucis sub figura X, line 15. What is the meaning of the serpent and the egg? 93 – They are universal symbols and each mean many things. 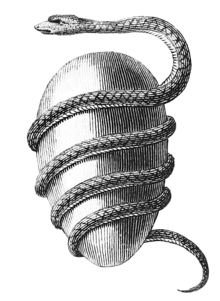 In the context of Liber LXV, the serpent represents the Holy Guardian Angel and the egg represents the aspirant’s heart or soul.